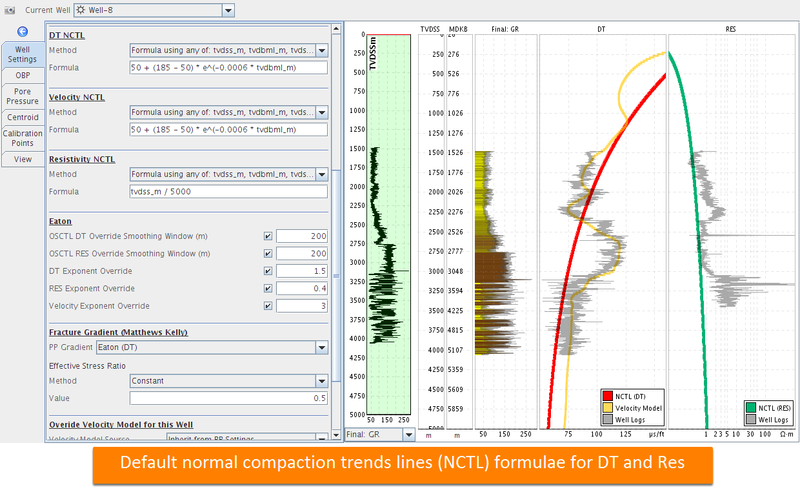 Velocity NCTL — the compaction trend for making PPP from seismic interval velocity (see 3D Model Building). 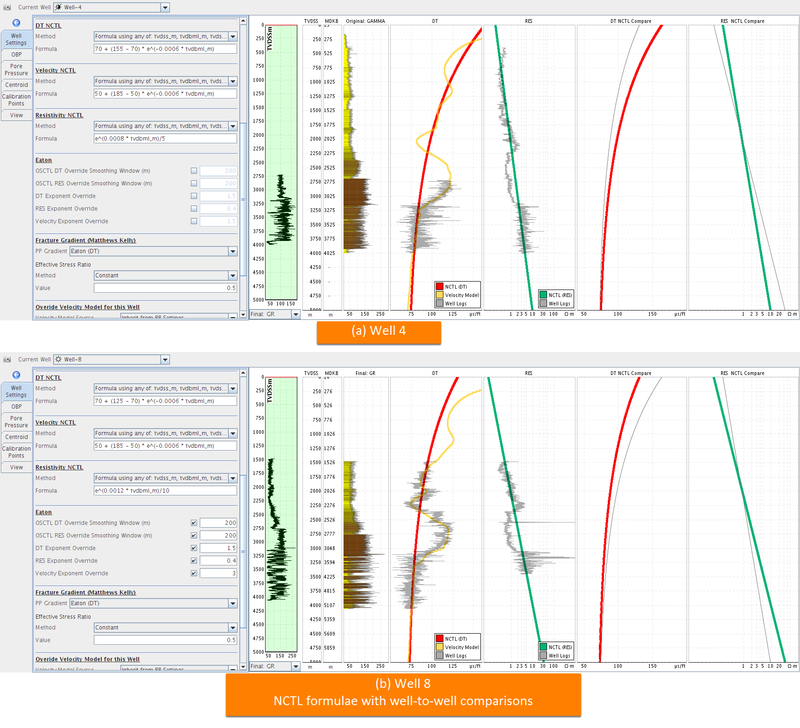 Note: The smoothed DT and Resistivity are defined as the “Observed Shale Compaction Trend Line (OSCTL)” (see Observed Shale Compaction Trend Line (OSCTL) for an overview of the OSCTL generation from logs). Upon opening a new well, the NCTL options are blank with red outlines. Defined by a single, depth-invariant value of sonic slowness; the simplest option. NCTL defined from a log curve. Under the Method drop-down, select Picked. To begin picking on the relevant track (DT or RES), right click and choose Start Picking NCTL. Left click to add NCTL picks at any depth and position; NCTL is linearly interpolated between picks. Left click and drag on the line to move the entire line. Left click and drag on a pick to move one pick; right click to delete a pick. Right click and choose Stop Picking NCTL. These are depth-dependent functions of “tvdss_m”, “tvdbml_m”, “tvdss_ft”, “tvdbml_ft”, where the suffix “_ss” indicates sub-sea, and “_bml” is below mud-line (or burial depth). You can provide any formula using these variables; the above are only examples. For 1D well calibration and local analyses, the NCTL may be designed to fit a particular well location. However, it is expected that the NCTL over a study area should be relatively consistent from well to well. For regional analyses and 3D model building (see 3D Model Building), the NCTL must be a robust function. 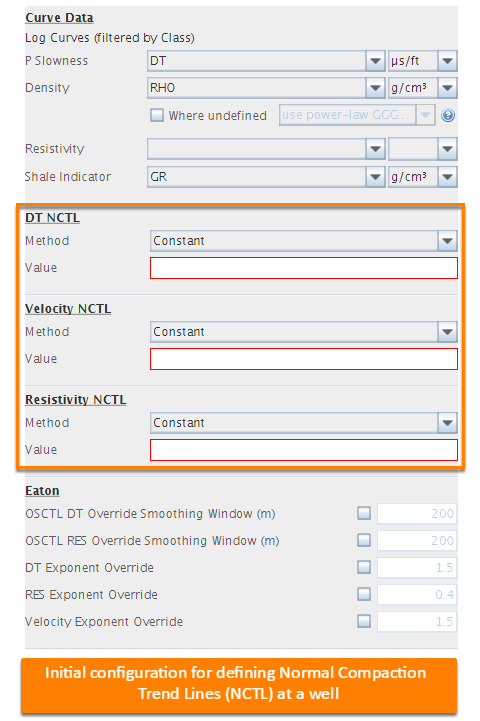 In the Tracks section of the View tab, select the NCTL Compare track to view the variation among the NCTL curves of all enabled wells and verify the spatial consistency. The NCTL may be iteratively adjusted such that pore pressure predictions match measured or interpreted pressures. Thus, the NCTL may be revisited and updated once pore pressure predictions are made from the logs (see Eaton's Method) or volumes (see 3D Volume Generation).